Gold Canyon is a hidden treasure just outside Apache Junction. It’s not quite a city or a town. It’s a census designated place whose name isn’t recognized by the National Weather Service and is often confused for “Gold Camp.” Yet despite this low profile, it hides truly extraordinary scenery and amenities that create an exceptional standard of living. Even Hollywood has come calling for movies like Blind Justice and The Three Amigos. If you own a home in Gold Canyon, you have made a sound investment. Upgrading to quality materials like Corian® countertops will help you improve the value of that investment. 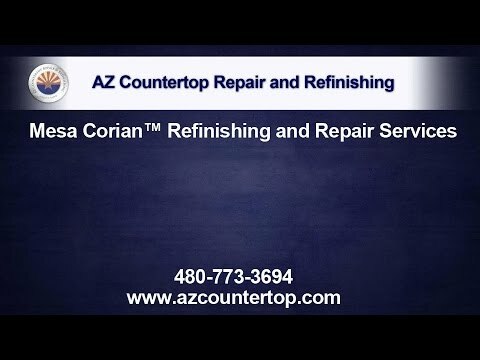 AZ Countertop Repair & Refinishing is here to help you keep your Corian® surfaces in top shape to preserve that investment. Gold Canyon Corian® countertop repair requires the use of specialized tools by trained professionals. The solid surface material looks the same on the middle as it does on the surface, requiring special skill to match the finish. Our expert technicians will perform the repair flawlessly, making your countertops look as good as new. No job is too big or too small. Over time, your Corian® countertops may experience minor scratching or discoloration through daily wear. Our technicians will use countertop refinishing to remove those damages and polish the surface, restoring its former beauty. Investing in countertop refinishing can help you avoid costly repairs later by stopping the spread of the damage. Finally, our technicians can cut holes in your Corian® countertops to accommodate a new sink, whether it’s a first-time installation or you are upgrading to a larger sink with several accessories. They will take care to ensure a precise cut with no peripheral damage, such as chips or cracks. Call AZ Countertop Repair & Refinishing today to learn more about our services for your Gold Canyon home. We have a reputation as the best for Corian® countertop repair in Gold Canyon! Job was done to my satisfaction! Got the job done as promised!